I had some other options for this week that rose to the top due to impending expiration. Then Harold Ramis died, and the internet was covered in Ghostbusters. But he wasn’t just Egon Spengler, and as the week went on, I was a bit disappointed that I wasn’t seeing anybody that seemed to remember even that he was one of the leads in Stripes, and I only saw an indirect mention of SCTV. None of the classic and cult movies he wrote or directed were at all mentioned, which is perhaps understandable, since writers and directors are less visible. However, Ramis was a guiding hand behind the camera for many more beloved movies than he acted in, and so many of them are so prominent that there are hardly any left I haven’t seen. 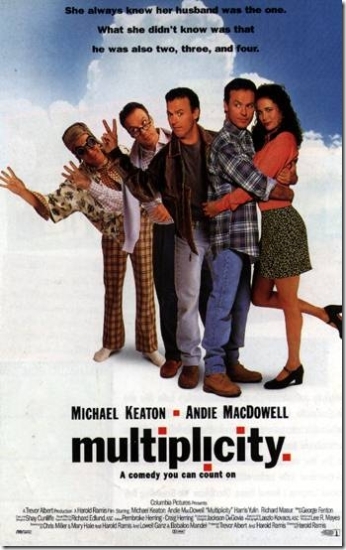 So here we have Multiplicity, a Ramis-directed film about a man who clones himself to keep up with all his commitments. Perhaps appropriate to honor a man wore so many hats to make movies people loved. Doug Kinney doesn’t have enough time. His job with a contractor already took too much of his day even before they had to fire an incompetent worker, his wife just got an opportunity to go back to work and needs him to spend more time with the kids, and there’s nothing left over for him. On one job he meets a geneticist who offers to clone a carbon copy of him, allowing Doug to divide and conquer his responsibilities. Number Two handles work, and Doug handles the kids and the wife. There’s still not enough Doug time, so he makes Number Three to handle homemaking tasks. Only Doug Prime is allowed to handle the wife. But with his identity spread out over so many increasingly different people with their own needs and wants, Doug’s life spirals out of control. I was surprised by the fact that the clones get discrete roles. I was expecting an equitable, scheduled timeshare of Doug’s responsibilities and recreation, but while this would be more practical, it would also kill off or dampen the plot, comedy, and philosophical themes. I was also somewhat expecting more existential dilemmas from the identity crisis of waking up one day to find oneself a clone, but there was probably as much as a comedy can allow, giving Number Two one and a half scenes to really be concerned about his second-class nature, and another scene where he reasserts himself as an independent person. Three and Four don’t go through that, mostly because the story doesn’t need to, but also probably for in-story reasons. Four obviously doesn’t even realize he’s a clone, and not only did we first see Three long after the revelation, but I also think he had an easier time because of Doug’s mindset at the time. Maybe it’s a side effect of making so many copies, but each successive copy felt less organic in differentiation. Number Two had the job farmed out to him, and quickly exaggerated Doug Prime’s own gruffer, tougher, more selfish tendencies. He felt all the way through like what Prime would have been like if he’d been able to put all his energy into work and live as a bachelor. Number Three was cloned in a different frame of mind, intended to handle domestic chores and argue with Prime less. Unfortunately, not only do I see hardly any of Doug in him, handling the homemaking immediately makes him effeminately campy, which is a strongly coded stereotype from which most of the jokes about Three seem to spring. Four is at least justified as what happens when you copy a copy, and while I’m generally not okay with the way his mental handicap is treated, he gets two or three strong plot moments. It is, after all, still the mid-90s. The effects to multiply Michael Keaton are impressive. There’s a lot of physical interactionthat I can’t see a seam in, lots of flawless timing matchup, and most shots that would have had to have had background replacement (bluescreen/greenscreen) were so well-done the only tells of such work I thought I saw I also noticed in scenes that had no need to separate elements, so I was probably only seeing tricks of camera optics that I wouldn’t have noticed if I wasn’t looking for them. The complications Doug runs into from outsourcing his life to himself reminds me of Click, which in turn reminds me of the fable of The Magic Thread. Prime goes out and does whatever he wants all day, and then tries to drop back into his life in the evening and finds that “he” made all sorts of decisions he disagrees with because he basically left the important parts of his life on autopilot. I appreciate it here more because the metaphor is at the same time hidden, complicated, and fleshed out by having Doug’s autopilot be autonomous people separate from him, instead of just skipping over parts and leaving a husk to fill in the blanks. This is simultaneously a story about ignoring all responsibilities and putting too much focus in only one of them, just wrapped up in a sci-fi/speculative fiction package that gives me a lot of fiddly things to think and write about. It’s a bit dated, but a lot of fun and worth revisiting.